A cohousing community is a type of intentional community composed of private homes supplemented by extensive common facilities. Such communities are planned, owned and managed by the residents, people who want more interaction with their neighbors. Common facilities vary but usually include a large kitchen and dining room where residents can take turns cooking for the community. Other facilities may include a laundry, office, internet access, guest rooms, game room, TV room, workshop or a gym. Members benefit by sharing resources, space, and items. There is typically no sharing of income, nor of ideology or religion. 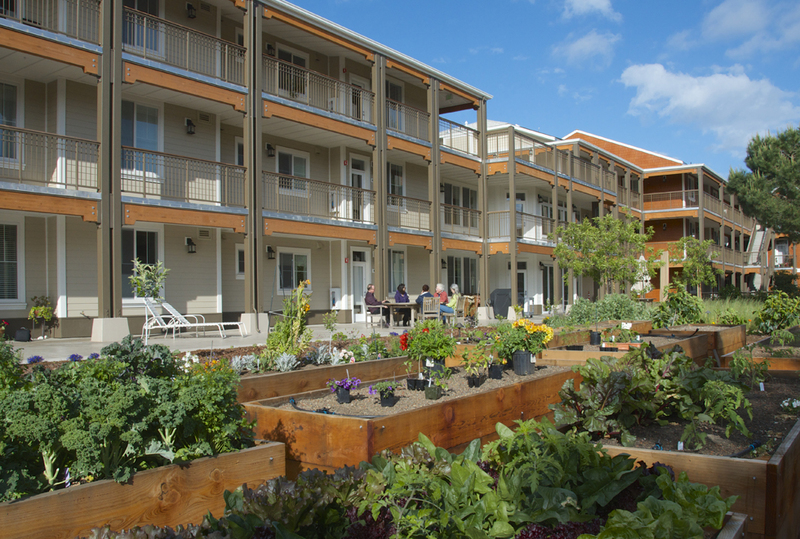 We the members of the Mountain View Cohousing Community (MVCC) have created and are living as neighbors in a cohousing community at 445 Calderon Avenue in Mountain View, California. Our goal has been to create and live in a new “old-fashioned” neighborhood of upscale, energy-efficient condominiums and common facilities. The design of the property and the buildings support our wish to live in a collaborative environment. MVCC is within easy walkable distance of our lively downtown, with its restaurants, library, performing arts center, and more. Breaking bread together and working together to accomplish our shared goals is a great way to get to know our neighbors at a deeper level and develop camaraderie. Common meals are held twice a week with a TGIF each Friday. Attendance is optional, although we have agreed that all will benefit if we all participate as time allows in meal preparation as well as attendance at meals. We are fully self-governing — see our FAQ page for more information on meals and the teams that handle the many aspects of living here at MVCC. For pictures of steps during construction as members and friends captured them, click Pix. To see our Vision and Values statements, click Our Vision.